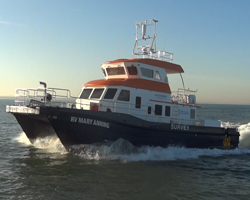 UK builder Blyth Catamarans has launched an 18.5m loa survey vessel for the Department of Biosciences at Swansea University. Named Mary Anning, after the nineteenth century English fossil hunter and palaeontologist, the £1.3 million (US$1.66 million) vessel will primarily be used to conduct local water and wildlife studies and to undertake coastal survey and mapping work. Mary Anning features an overall beam of 6m, draws 1.3m, displaces 32tonnes and has been coded by the UK Maritime & Coastguard Agency (MCA) to accommodate up to 26 ‘passengers’. The vessel has been developed with 61m² of deck space, strengthened to 1.5tonnes per m² and complemented by a Pesci crane, rated 2.46tonnes SWL at 4.25m, and four Hardy winches, rated 2tonnes apiece. Onboard facilities for her scientist/student complement include two cabins, a wet lab, a service station and a dinette/galley area. The vessel is powered by two MAN V8-1000 engines, each rated 735kW, which drive a pair of 787mm-diameter propellers, manufactured by Clements Engineering, via ZF 550A gearboxes. Mary Anning also employs a pair of 6.3kW bow thrusters, manufactured by Side-Power. Onboard capacities include 5,450litres of fuel oil and 340litres of fresh water. Sea trials hosted in Q4 2018 saw the vessel hit the 28.4knots mark, Blyth Catamarans reports, though her cruising speed is expected to be more in the region of 18-19knots. Mary Anning will also feature in our annual round-up of innovative new deliveries, Significant Small Ships of 2018, which is due to be published in February 2019.